John Newsinger has written a useful book* about the 1913 Dublin lockout and the Easter Uprising of 1916. He explains the importance of James Larkin and James Connolly in both these historic events. Larkin's origins were as a docker living in Liverpool; he was active politically, having joined the Independent Labour Party in 1892. He moved to Belfast in 1907 where he became an organiser for the National Union of Dock Labourers. 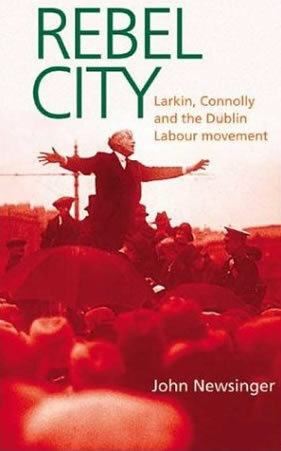 Larkin, who had embraced revolutionary syndicalism, was successful in uniting both the Catholic and Protestant workers. A dispute broke out amongst sections of dockers over pay and working conditions. But Larkin failed to understand the role of trade union leaders like James Sexton of the NUDL. He was a notorious right winger who sold out the strike from under Larkin's feet. "Their position as a trade union official gave them interests and perspectives that were distinct from the rank and file. For them trade unionism had become a middle class career." Larkin was set on a collision course with these leaders and after the defeat of the Belfast strike, he set out to recruit dockers and carters to the NUDL. During the 1908 carters' dispute, Larkin was responsible for recruiting hundreds of rank and file workers to the NUDL. But he was to come into conflict with Sexton who sacked him. "The ITGWU drive to organise Ireland's unskilled workers has to be seen as part of the great labour unrest that swept over Britain from 1910-1914. This strike wave included Dublin where there were 30 strikes alone. The employers were terrified. It was a revolutionary uprising, the promoters of which intended the destruction of society." "Connolly believed that the struggle for national liberation [against Britain] would only be accomplished with the overthrow of capitalism." In 1913 the famous lockout in Dublin occurred. Larkin and the ITGWU had managed to turn Dublin into a union city. He had recruited and organised every section of workers. Most employers were forced into a conciliatory position with the exception of William Murphy, then the leading Catholic Irish capitalist who was opposed to any form of trade unionism. Workers who were employed by Murphy were sacked for joining the ITGWU. Larkin and the leadership were arrested by the police. The police and the capitalist state used its full force against strikers, some of who were clubbed to death. Liberal commentators condemned what they described as the "most brutal constabulary ever let loose on a peaceful assembly". Murphy was out to smash the ITGWU. The lockout spread all over Dublin. There was working class solidarity all over Dublin, which quickly spread to England. Workers in Liverpool, Birmingham, Crewe and Derby came out on strike in support of Larkin and against the lockout. There was a campaign to free Larkin and calls made for a General Strike until Larkin was freed. With miners and railway workers out on strike, Asquith and the Liberal government were compelled to released Larkin and the other Leaders from jail. This was a great victory and showed the strength of the working class in Britain and Ireland. Connolly advocated the formation of the Citizen Army and the continuance of mass picketing. "Carry the fight to Britain" was the call. The Irish Republican Brotherhood refused to support the ITGWU and this revealed its hostility to the Irish working class. When the fight came it was the ITGWU who were the true republicans. With Many Dublin workers locked out and their families starving, there was support from British workers who sent £50,000 worth of food parcels to the ITGWU and its supporters. The leadership tried to secure a compromise settlement, but as Newsinger observes, the Dublin employers led by Murphy "did not want to inflict defeat on the ITGWU, but to completely destroy it". Larkin came to Britain. There was tremendous solidarity support in Manchester. 130 NUR rail union branches called for action. In South Wales, rail workers and dockers went out on unofficial Strike. The response of the TUC leadership was to head off the movement and they called a special conference. Newsinger criticises Larkin for agreeing to the TUC conference and feels that unofficial action would have resolved the situation. He says: "The union leaders would have been carried along by the momentum of the movement." But he produces no evidence to back this assertion. On 9 December 1913 the TUC Special Conference met and predictably there was a sell-out and betrayal of the Dublin strikers. As Newsinger comments, talking about the reason for calling the conference: "In reality it was to decide what was to be done about Larkin." Ben Tillett, the dockers leader who Larkin had considered a fellow supporter, "wielded the knife that struck the fatal blow". This final decision not to support the Dublin workers led to defeat and intimidation with the full weight of the state used against the ITGWU's members. The second part of the book deals with Connolly's role in the 1916 Easter uprising. The insurrection was organised by the Irish Republican Brotherhood, while the Volunteers who supported the imperialist war of 1914, were opposed to the rising. Unlike the IRB, the Volunteers were a purely nationalist organisation and hostile to the working class. The date of the Irish uprising was 23 April 1916. There was confusion because a German battleship carrying arms to the Irish was scuttled by the British. The leaders of the IRB's military wing nevertheless proceeded with the uprising. Newsinger compares Connolly's role to Trotsky in 1905, when he lead the St Petersburg Soviet. But Newsinger's weakness is that he defends those commentators who claim that the 1916 rising was a "terrible mistake". Trotsky himself later wrote that "those who are opposed to the seizure of power are always ready to see pernicious adventures in uprisings that fail". Connolly was a courageous socialist who argued for a workers' republic. But he was no Marxist. He never broke from religion and took holy communion before his execution by the British. By the time of the 1916 uprising, Larkin had already left for the United States and was opposed to Connolly's involvement in the Easter uprising. The Bolshevik Revolution in 1917 was celebrated in Dublin by thousands and thousands of Workers and introduced a second wave of militancy that lasted until 1923. There was big strike wave in Britain and Ireland and the ITGWU membership grew rapidly. Larkin was a founder member of the Communist Labour party in the USA. He supported the 3rd International of Lenin and Trotsky, travelling to Russia for meetings. During a strike wave in the United States, Larkin was arrested and imprisoned in 1920. He was pardoned and returned to Ireland in 1923, but found himself in a minority amongst the right wing leadership of the ITGWU. The ITGWU split and Larkin and his brother Peter founded the Workers Union with 16,000 workers in Dublin. Soon he became a supporter of Stalinism in the Soviet Union. As Newsinger comments that although "a word from him against the murders, purges and trials would have carried great weight among workers throughout the world it was never forthcoming".